From A Paradise Choir. Image courtesy Chris Kallmyer. 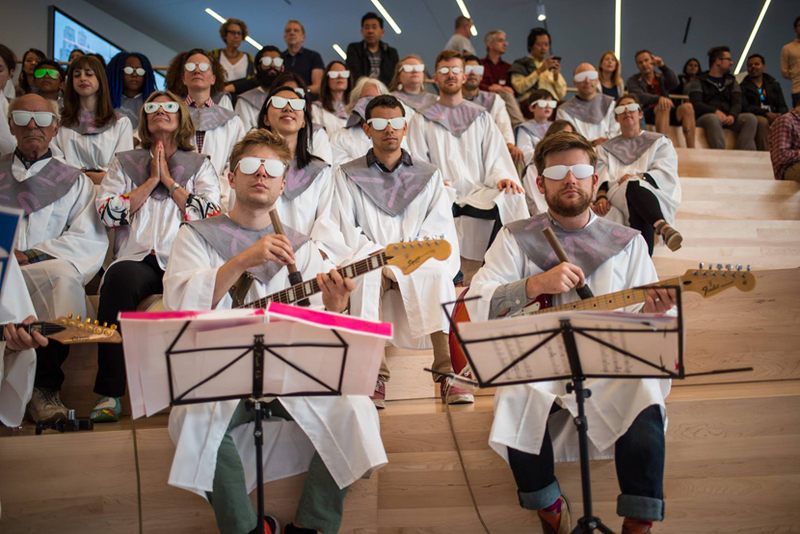 Chris Kallmyer’s A Paradise Choir asks museum-goers to listen to the new SFMOMA. In a four week residency, moving and sited “choirs” provide different sound experiences — from percussion strikes to Gospel music — in galleries and public spaces. If museums aim to sharpen our eyes, A Paradise Choir, heightening an interest of the new campus’ architects, Snøhetta, seeks to open our ears. CHRIS KALLMYER: This is an interesting piece because it’s so fitted to the site. It’s so here — not just in the utopian way; it really couldn’t be anywhere else. There’s not a space like the white box anywhere else. KALLMYER: I conceived of A Paradise Choir as a new shape note singing, a new method of American folk music. And as I worked, I moved away from notation towards the body and the building. The project would’ve been such a train wreck if it was all about notation. So do you want me to read this? SMIGIEL: Yeah. I think yeah. SMIGIEL: Right, the one from Cally Spooner. KALLMYER: I started thinking about how a wall text or a recipe might look for our piece. SMIGIEL: I was surprised when I saw this draft of this statement that it started with a folk choir. Could you say a little bit about how folk music figured as a starting point in this? KALLMYER: I wonder if maybe folk music is the original social practice art form. Communally authored over time by regional groups of amateur musicians, artists, doers, and makers. I mean, as someone who’s never personally identified as a social practice artist, I tend to see myself as an expanded musician or a sound artist, maybe an artist that functionalizes music to look at other things like a place or people. I think that there is something to discovering an American Experimental Music that isn’t rooted in Western classical music, but American regionalism. What is it like to make an experimental choir that’s rooted in this folk tradition, rather than a classical tradition that prizes singular authorship and virtuosity? SMIGIEL: When I was thinking about folk, I was thinking, oh, isn’t that different than the worlds we might identify you with? Which would be experimental music, which I think we think of in terms of difficulty and the avant-garde. And the other would be classical, which we probably think of — especially from an art perspective — in terms of virtuosity, as you said. And this is neither of those. KALLMYER: No. The thing I’ve been looking for in this project is a kind of virtuosity of listening that neither requires training nor a lineage towards European classical music. This project asks, can an experiment be rooted in older community forms? Could a group of people be virtuosos together in something like empathy or listening? Can we be yelling virtuosity? And can you touch on that in brief, intense experiences? Obviously, we will never get there in this project. It’s not the Bauhaus of choir. [laughter] We aren’t teaching this kind of knowledge, but are exploring soft-skills together with members of a temporary choir. SMIGIEL: You’ve measured the — this may be the wrong phrase — the uses of the vernacular before, right? Like the Baseball Day to Day project. That’s basically a riff on “Take Me Out to the Ballgame,” which everybody kind of knows. KALLMYER: Yeah, totally. In projects like Baseball Day to Day, it’s about creating scenarios where people might get together to have an experience with sound that is visceral and specific. We are gathering to listen to sounds in baseball. Not all the sounds in baseball — but to discuss, explore, and exercise the sound of catch together. This is similar to the concept of “now moment’ that we liken to Fluxus, Allan Kaprow’s work, or Francis Alÿs’ work. The now moment, action, reaction, memory, rehearsal, performance, event, all these things. SMIGIEL: And this project was an endless game of catch, for the Walker, right? KALLMYER: I’m really interested in how we find a place-based regional practice, and instead of bringing this vernacular activity into the critical eye of the museum — I want to bring the critical eye outside, into life. Another way to invite this level of listening is by having specificity in what we’re listening to or exploring. My events often host members of these incredible microcommunities: You might come out because you’re interested in experimental music, a lawnmower enthusiast, a batting coach, or a choirmaster. SMIGIEL: Right. And so the choir is really the vernacular here for this project. The line you have, which is quite nice, is “strangers all dressed the same.” So, why choir and not karaoke, if you want to get people to sing? KALLMYER: It is way cooler. Karaoke’s about the individual; it’s about showing off, drinking… karaoke is modern. Choir is old. Choir is not about being an individual, but blending into a group, and a community of singers. SMIGIEL: From the producer side, we’re very interested in creating these multiple choirs of witnesses. So we have key choirs moving through the museum doing experimental music or gospel music or percussive pieces. They’re obviously robed; they are A Paradise Choir for that weekend. And then a large accidental audience of museum goers are running into us, and we’re inviting them to put a robe on and join us, and one of the challenges is that we’re encountering some resistance. What happens when there isn’t any resistance? I haven’t been in these workshops with you when you get a destination audience that wants to be there with you. KALLMYER: It takes no effort. “Welcome to the workshop, put on a robe.” Like, this is what we all do now, you know? It is similar to the experience of being naked. SMIGIEL: If we all take our clothes off. KALLMYER: To more aggressively look at your question— why is there resistance? What shifts when you have the audience that participates and/or buys in? I mean, it’s kind of the question of, am I just going to sit there and watch you two play catch, or am I going to play catch? I think a lot of it is intent. “Why should I put a robe on? I can listen perfectly fine from where I am, how I am.” That’s perhaps the attitude of the person who stumbles upon the architectural tour. Our current contract with the experience of going to SFMOMA reads like this: “you buy a ticket, and in return we give you access to art.” If the contract read: “you don’t have to buy a ticket if you wear red today” You’d probably have a museum full of people wearing red. For our baseball piece, the contract involved a lot of prep. We had forty-five minutes of warmups, including a workshop with a glove expert; you oiled your glove and you talked about glove maintenance. It was half oral history, people telling stories of how their fathers and mothers took care of their gloves, and half advice column. And then they did light stretching, which was a movement workshop with a dancer. But because he was in a baseball uniform, everyone believed he was a baseball guy. And then in the third leg of the warm up, people played catch with lemons, which smelled incredible. It comes from a Fluxus score I found from Ken Friedman Fluxus score, Fruit Sonata: play baseball with a fruit. SMIGIEL: The tour is still creating a certain kind of interference in the museum, simply because of the emphasis on sound. And perhaps the invitation to join. But I do want to focus on this formation of a temporary community, when you’re all in the workshop in the robe. A lot of your work and the way you talk about you work is trying to break the very highly structured, “I am the musician who plays and you are the listener who receives.” To fiddle with that unidirectional relationship. In many ways, you use the workshop as a kind of medium. I wonder if this connects to how you trained as a musician. It’s the clearest way to basically say, I’m the teacher, you’re the student, but we both get to do something here. KALLMYER: From a musical perspective, we presume the sole content of something like John Cage’s silent piece 4’33” would be the sounds that happen within the period of accepted “silence.” But in the case of A Paradise Choir, I think the sole content of the work is listening. The piece is about inviting an action, and whatever you find within that durational action, we can call music. This perspective prizes the listener as the primary activator in music or the viewer as the activator of art. The thing that’s cool about the choir, especially in the workshops, is we can turn listening into a kind of performance: everyone dons a robe, we do breathing exercises, stretching, we adjust each other’s robes, we walk, we sit, we listen. The workshop participants become a kind of ensemble of listeners. An experience with experimental music could be described as a highly present experience with sound. That is the kind of experience we are giving in our workshops. It’s just that all the sounds are being made by the workshop members and not a trained class of musician. That’s been one of the big goals of the workshop: how to create a scenario that is horizontal with the public where the primary activity is cultivating a presence and critical dialogue around the sounds, no matter what they are. SMIGIEL: Why pursue this kind of activity through the art world as a distribution means? What kind of static —or what kind of enabling — happens, when you’re bringing sound into a space that is fundamentally not about sound? I mean, one of the reasons we’re probably getting some resistance to folks just donning a robe in a museum gallery is because galleries are places where you look at things. And you don’t want to be one of the things that’s being looked at. KALLMYER: That’s so true. You want to be the one looking. Everything about the museum is to erase you, for the primacy of the objects. SMIGIEL: I would think, if I were a musician, the last place I would pick to do my work is an art context. KALLMYER: The visual art world does such a good job talking about ideas. It creates a place to think about ideas. But I think the quality that is special about music or sound — and I’m not sure if the music world looks at it this way, but I do — is that music is a time where we can think about ideas. My work is durational — the durational nature really links in with all this other great art that I love. I feel more akin to Alison Knowles than Stockhausen. Obviously it’s more fluid than this, but we like to think that music and visual art are different mediums. But they’re just that; the medium idea of making the work, while there are deeper concepts that connect me to both Knowles and Stockhausen. 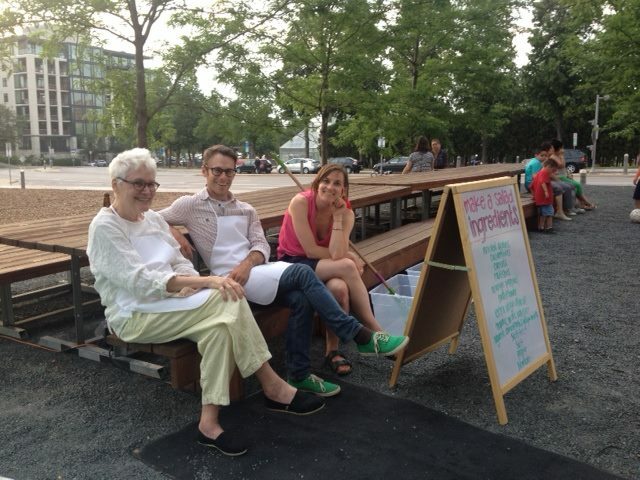 From L to R: Alison Knowles, Chris Kallmyer, Natalie Harren. 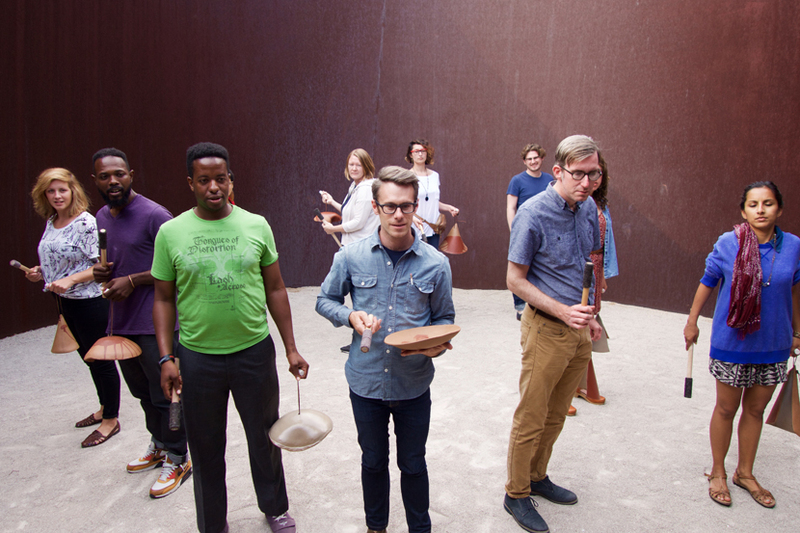 Taken during Knowles’ “Make a Salad” performance at the Walker Art Center, 2014. Looking at Francis Alÿs — I love the way he deals with rehearsal and performance and the creation and recreation of his works. I love the way he thinks about context. I’m really interested in how he deals with history and memory. The music world cares about many of those ideas — rehearsal, performance, memory. There’s a lot of interest in perception, psychoacoustics. But man, you start to mess with the context of performance, it just kind of casts you out in a weird way. I started floating, maybe like ten years ago, doing these kinds of performances with my peers and friends, finding a home working with Mark Allen at Machine Project. I got scooped up by the visual art world, and feel very much at home. It didn’t feel that linear, but you get the idea. SMIGIEL: — for people who aren’t doing this as a profession or haven’t studied the history of visual cultures. There’s something about music that feels democratic by comparison. KALLMYER: Yeah, but music is even more mysterious than the Calders. Sound is invisible, immersive, tactile, locational. A sound can surround us, and we have named it a song. It almost means nothing. SMIGIEL: But we can sing along. KALLMYER: We can sing along, but people have a really hard time with mystery and they have a really hard time with things they can’t name. I think that’s exactly what people are responding to when they’re saying, “I just don’t know what that Calder thing is for,” its like saying “I can’t figure out what value or function it has in my life.” I mean, it’s beautiful, but like, what is it? The thing that I don’t quite understand, working with the public, is the difference between experiencing mystery and responding with delight, and those who experience mystery and respond with frustration. Music has a way of blending abstraction and pleasure. Music is just like a Calder. It’s un-languageable, it’s got a time element; there’s all this sensation you can receive from these kinds of works. I mean, music is a weird thing. Even Beethoven. What the hell was that? People gather in a space and sit for upwards of two hours. Vibration is manifest in a space and it’s the loudest thing that they hear, probably in their lives, except for war. Wow. Right? Sound appears, sound surrounds you and touches you. And when it’s gone, it’s gone. There’s nothing there. That’s incredibly mysterious, you know? And yet music feels somehow natural. Painting as a practice has probably been around for, what, 60,000 years? Music has probably been around for 160,000 years, and arrived with language. So there’s a kind of naturalness to music, even though it’s totally unnatural or mysterious. And the reason that I think it’s important to give these in a visual art context rather than music context is that it’s a brief encounter with that mystery. And it’s intense, I hope; you have a quality of listening and presence that you won’t get when you stroll through the galleries. In the Architectural Tours we give, we ask people for fifteen minutes of their time, and they may not give fifteen minutes to any one work in the collection. SMIGIEL: One of the things I really value about your work, and that a couple decades ago, or even in certain quarters today, might be looked at skeptically, is the generosity of the invitation. You’re not pursuing a strategy of putting stuff in the gallery to startle people. It’s neither, perhaps, a punk rock attitude: “screw you.” It’s not a classic avant-garde shock the bourgeoisie; it’s being very generous with vernaculars. How conscious is that generosity for you? Especially knowing that you’re often coming out of a musical tradition that could care less about that positioning of the audience. I’m sure we’ve both been in different seminars where there’s a suspect move. Think of the classic graduate seminar model: if it’s not challenging, it’s kitsch. We have to be on our toes still, we have to work. I think shock is supposed to snap us into the “now” very suddenly — and it does. However, so does meditation, which is more of a slow soak in the now. Meditation is a practice. And shock is a verb. A Paradise Choir is really about inviting people into a present moment practice to see the world/each other/art through a more mindful lens. But you bring up a really good point, because the invitation is met with a lot of skepticism, and rightfully so. Sometimes my work uses everyday stuff that’s really common, with the point of assembling a really diverse group that touches on a central interest like baseball, lawncare, or cheese. I might accidentally reach out to people who might be politically on the opposite side of the spectrum, who might be involved in the money industry or the industries of violence. We have an incredibly violent economy, that doesn’t prize the sanctity of each other’s bodies. And so part of me feels responsible to create change by inviting people into an experience that uses something familiar, in a way that is presence-building. I think the coarsening of our country comes from a lack of presence. Commonfield Clay performance by Chris Kallmyer. Pulitzer Arts Foundation, 2015. Photograph by Carly Ann Faye. SMIGIEL: Could you talk a little bit about Commonfield Clay? You’re dealing with St. Louis — a decaying industrial economy built on bricks. Everything about post-industrial America rusting. KALLMYER: I went to work in St. Louis shortly after Michael Brown was murdered by Darren Wilson in Ferguson. I was astounded by the unbelievable tension that existed. I’m a white guy; I grew up in the suburbs, on the border between D.C. and Maryland. And so I went to St. Louis and found this incredible tension. Michael Brown’s death was not the cause of the tension, but a symptom, coming from so many years of mistreatment of African Americans by the government of St. Louis. I was working with The Pulitzer Arts Foundation, a museum very close to a dividing line in the city, Delmar Blvd. This street cuts between the two halves; so across Delmar is this long-held African American neighborhood that’s essentially fields and row houses that pop up here and there. The homes that still stand are so beautiful, but there are issues with brick theft that make the fate of these homes unknown. Inspired by the brick, the theft, and the people I met, I worked with a ceramicist and we created a set of bells dug from clay on the river. This is the same kind of brick clay that is used to build homes throughout the city. In St. Louis, I was trying to figure out a way to create a porous project that could bring in leaders in the city who know each other, but don’t ever have a chance to interact outside of their work, activism, and urgency around they year after Ferguson. And then after we built these clay chimes, we held a workshop, and we held a concert. The workshop was a full day for eleven Black Lives Matter activists, poets, urban planners, people who ran art spaces in the city. Non-musicians. It was a workshop on listening and performing on the bells. We shared a couple meals, held conversations, learned how to play music on these chimes together, and communally authored some works. That was my first time delving into being really honest about folk music. SMIGIEL: I’m super interested in how you think about and shape and invite these kinds of collaboration in your work; there aren’t rock stars in folk in the same way. KALLMYER: No, no, not at all. If you look at the origins of American folk music, you might find that it never existed. What existed was hundreds of microregions that had their own local flavor for what folk music would be. So in your valley, you might’ve had one Polish family that brought with them, you know, the gadulka (a Polish fiddle), which colored the way that valley wrote and created music. Folk music, unlike classical music, is communally authored over time, generation after generation. Classical music is a god form: there’s a single person at the top who authors everything, and then that’s exercised by a group of people. So imagine if everyone has their hand in both the creation and the exercise of the thing and that’s your folk form. SMIGIEL: Who I would hardly think of as folk art. In terms of level of abstraction and perhaps difficulty. KALLMYER: Well, but in terms of material, it’s everything you can find in your junk drawer. SMIGIEL: Yeah, Tuttle in particular. KALLMYER: Tuttle made a set of his wire pieces, and Sandback showed sketches, scores, a rare moving work with yarn. Calder largely worked with scrap metal. We call folk craft what it is because of the communally-offered nature of it. That’s one important thing: context. Another is material, and a third thing is form. And here you had three visual artists who were using what could be construed as really basic materials, folk materials, but were doing it in this brand new form. It could be construed as a kind of future form of folk art, if you were, you know, high on LSD. I started thinking, what would a future form of folk music look like? And returning to this adage about American folk music that I’ve been tinkering with in my head, I thought it would be hyper-regional. It would be communally offered and authored. It would be about building, with other people, a new repertoire, a new way of working. And so it could operate outside the form of American folk music, but use regular craft materials, like clay. The work could be communally authored, unlike the Calder and the Sandback and the Tuttles. (Unless you consider art to be a communally authored form, which it might be over time, I mean. Art’s a game. Duchamp, right?) So I started thinking about that, and that’s how the piece came about. The way A Paradise Choir interacts with regionalism is it’s totally porous. If we took this to Minnesota, we’d have Lutheran music, we’d have Scandinavian singers. There’s a huge Somali population; there’s a great vocal tradition there that would be involved. You have no Somali population here. KALLMYER: So we aren’t dealing with that. What’s interesting about this piece to me is when it’s in a place, it acts like a sponge and takes up the concerns and interest of that place, I hope. A Paradise Choir is a set of truly empty robes, until you have people creating activities. I think there’s immense potential, with A Paradise Choir to be doing non-musical works, as well. To be doing more dinners, to be going on runs together, going to the gym. Although robes are really dangerous at the gym. KALLMYER: I don’t know, does that answer the question a little bit? SMIGIEL: Yeah. This isn’t a question; maybe this is a statement from my side: part of me is hopeful that A Paradise Choir is being initiated here because there’s something about a Western spirituality that interests you. SMIGIEL: And that this could not have been birthed in New York. SMIGIEL: And so I wanted to come back to the “paradise” in A Paradise Choir, and ask you to talk about the ideas of transcendence in the American landscape in the West. The desert as infinity, versus paradise, right? I’m trying to think of all these ways that traditional ideas about theology, spirituality, cannot help but course through something called A Paradise Choir. And what are those traditions right now, as they’re coursing through you, having a history here, having probably conceived of the piece in LA, knowing it was coming back here? KALLMYER: There’s something about this concept of paradise that hints at California utopianism. And then my own journey West probably. Also a kind of creation of a new paradise in San Francisco that’s run by money and technology. The making and remaking of cities that you find within that. Anna and Lawrence Halprin, my friend Fritz Haeg, sound healers, communes that dot the coast going north from here, NIMBYism, developers, tech companies, food producers, farmers, and artists all contribute their version of Paradise to California. SMIGIEL: Oh, meaning an enclosed space (as you mentioned to me)? KALLMYER: Yeah. I love that the piece speaks immediately to architects, in a way that I didn’t totally anticipate. I was hoping the piece would be, in one way, a look at something limited, which is acoustics. Who cares about acoustics? I mean, acoustics are interesting because they’re invisible. They put us in a place. Even those who won’t look up from their phone will look up because they hear something. A paradise, an enclosure is the very definition of architecture — and the thing you enclose — the ether, the air, the plants, the people, the activities, the sound, the light; that can become paradise. It is limitless in scope — limited in space. 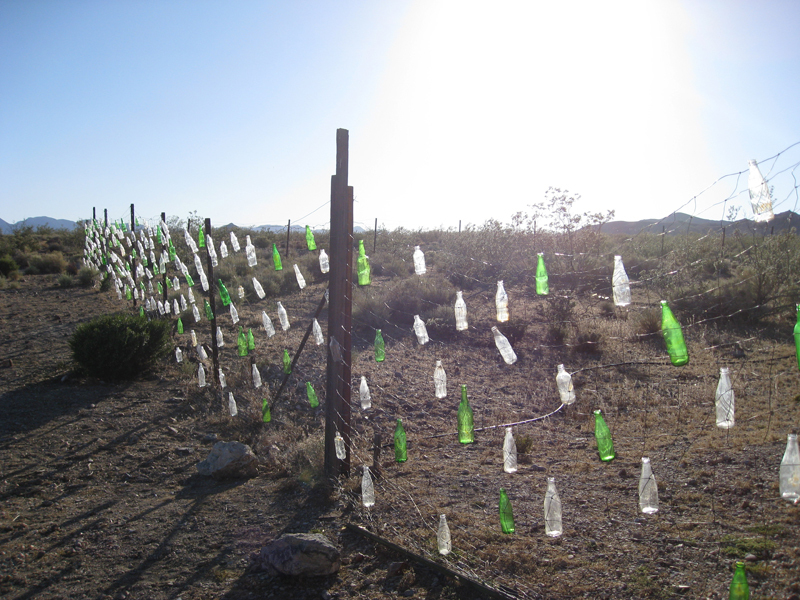 Bottle + fence construction used to produce sounds for Rhyolite (2016). Image courtesy Chris Kallmyer. SMIGIEL: It’s a good definition of a desert, too. KALLMYER: I mean, so living in the desert — I lived outside of Death Valley for a summer, a couple years back — I thought I’d go to this kind of empty, infinite place. But I found it quite finite, and not really empty at all. It was filled with all these markings and prints from people who had lived there a hundred years before, when it was a Gold Rush town. You could literally see tent sites where people slept on the ground a hundred years ago. The dirt was compressed and nothing had grown there. On the East Coast, if you leave history in a place, if you leave a bottle or a piece of trash or a footstep, that footstep is covered up by the leaves in the fall, by the rain in the winter, by grass that grows in the spring, right? In the desert, if you make a footstep, you’ve left a kind of fingerprint — I was astounded by the layer after layer that was available to me. I could see the road that went to the mines in 1898. I could see next to that, the road that went to the mines in 2009. They were the same. And yet they were different; you could see the various grades of plants growing back. And still, they look totally different from the land next to them, which had never had a road. So there’s a kind of layered history that exists here in the West that is part of a continuous now for us. In Europe, my best Italian friends might think of it as a continuous now from the Roman times to present day. I think that it takes a lot of courage to think of time like that. Or it takes at least some energies to sense that, right? I hope to create works where you can sense that kind of continuous now, if that makes sense. Which is why I think I’ve been grabbing onto stuff like baseball, and a choir, which have really no ownership to 2016, but lots of ownership going backwards. KALLMYER: I went to the desert to work on a trumpet piece. And once I got there, it was like, oh, this is the wrong tool. It’s the wrong medium to address these concerns of the place. Walking the land, I found bottles left by the gold miners; eventually, I collected enough that they were all blocking the door to my studio. The wind would catch the bottles and create this tone. I was fascinated with that and I started hanging them on the fence adjacent to my studio. By the end of a couple weeks, I was spending all of my time doing this, until I had 200-plus bottles on this fence; it sounded like this dense, wind-activated drone. It was really kind of mysterious, and it was omnipresent; it never stopped, except at sundown, when the wind would reverse direction. I went back and made some proper recordings and released them on a record with Lucky Dragons and Julia Holter. I worked with them because I felt like the wind was just one story to tell about the landscape there. And the gold miners were just one story. Lucky Dragons has a way of understanding landscape that’s about patterns and collecting patterns found in a place, the kind of recursive nature of the frontier. And Julia Holter has a way of understanding landscape through people’s stories; if my recording is cold, hers is very warm. For me, a piece is often not made in a crystalline, singular structure, but by inducing multiple elements into a space and seeing how they play. So that’s what this piece became: a set of writings, recordings, design (by Becca Lofchie), and images, with these three authors. It’s more interesting than if I would’ve put out this austere recording of a fence. It would be fine, but — I am always looking for multiple ways in. SMIGIEL: Last question, then, to get us from the desert back into the project here. How are you dealing with there not being a natural world here in the museum? You couldn’t be in a more controlled environment. Have there been any particular challenges or barriers with that fact? KALLMYER: We still operate by a lot of the rules in the outside world. There’s signal and there’s noise. There’s light and time. What we do in this piece is maybe bring in some of the pedestrian space that you find in the outside world, into the museum. I feels, like Sandback always described, “a flat-footed pedestrian space.” That’s why his structures sit on the floor and not on a vitrine, right? What we do, I think, is related to this idea, just by creating environments where people bring a critical framework to the banal. Or we ask them to shift that framework from song to space, or from visual content, like the Agnes Martin works in the collection, to the aural, and to look at the relationship between those things. If we were to host A Paradise Choir at a space with more relationship to the outside world, like the Headlands Center for the Arts, obviously, things would change; but I can’t think, actually, the music would change, so much as the activities. Maybe A Paradise Choir should roast a boar. Maybe A Paradise Choir wants to go to the beach together, you know? Or maybe it just functionalizes that land differently. The Halprins. Right? Within their utopian conception, at the end of the day all we have are Resources, Scores, Valuaction, and Performance. When we get to making we negotiate within these elements. The work comes from their unique constellation.